Jeffrey D. Allers has played and designed games since he was a child. 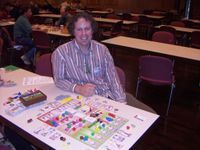 After moving to Berlin in 1994, he was introduced to modern German board games and joined a gaming group in 2004 where published designers regularly tested their prototypes. Soon after, he was bringing his own ideas to the group, and has had his games published around the world since 2008. In 2005, he also began writing a series of online articles titled "Postcards From Berlin," first on GameWire, then BoardgameNews and now, the Opinionated Gamers and on his blog Berlin Game Design. He enjoys writing about game design and his experiences as an American expatriate living in the midst of the Berlin boardgame culture. In 2006, together with friend and co-designer Bernd Eisenstein, he founded an open game designers' meet-up at the newly-opened Spielwiese gaming cafe. Over 50 designs tested in the group have been published by the international group that meets every Monday night. He has also taught game design workshops in schools and has spoken on the topic as a guest lecturer at Berlin's Technical University as well as visiting university groups from the United States. For his "day job", he has worked as an architect, youth pastor, TESL teacher and director of a Christian community center in partnership with the German free evangelical church.